BOE attracted the big attention of visitors by unveiling the world’s first 2 types of QLEDs(5 inch, 14 inch) based on electroluminescence quantum dot technology. BOE’s 5 inch QLED has a resolution of 320 x 240 (80ppi) with LTPS TFT. On the other hands, 14 inch QLED has a resolution of 960 x 540 (80ppi) with oxide TFT. 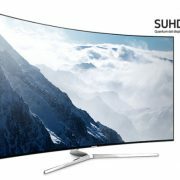 BOE’s QLED display this time is special because it is an ‘electroluminescence quantum dot technology’-based display without backlight, unlike Samsung Electronics’ SUHD TV based on ‘photoluminescence quantum dot’. In general, quantum dot-based displays are categorized into two types of mechanisms: photoluminescence quantum dot and electroluminescence quantum dot. Photoluminescence quantum dot technology has a mechanism where the material stimulated by external luminescence emits light again. 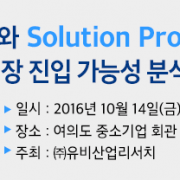 Samsung Electronics applies this technology to its LCD TV by using the QD sheet attached on blue light emitting from backlight. On the other hands, electroluminescence quantum dot technology has a mechanism that emits itself when electricity is put, and its material is inorganic and structure is similar to OLED. 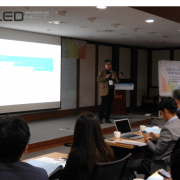 A BOE employee explained “QLED display improves its reliability by using inorganic matters for existing OLED structure instead of organic matters, featuring better color gamut than OLED. 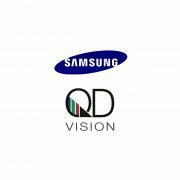 100% inkjet printing-based QLED is better in terms of manufacturing cost saving and large scale, compared to deposition-based OLED”. 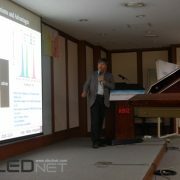 The industry has expected that it will take more than 5 years to mass-produce QLED display, so according to BOE’s research, there’s a keen interest on how much the commercialization of electroluminescence quantum dot-based QLED is moved up or how much it influences the display industry.